We recently received a response from Phil Ginsburg, General Manager of the San Francisco Recreation and Parks Department (SFRPD) , to our concerns regarding the “Natural Areas Program” (NAP). We thank him for the detailed response, but we still have a number of points of disagreement. As readers of this website know, that’s very different from our own analysis. We find that NAP uses nearly as much of the ‘Most Hazardous’ and ‘More Hazardous’ herbicide as the rest of SFRPD (ex Harding Golf Course). And the discrepancy is the more surprising since the source documents are the same – the Monthly Pesticide Use Reports each section submits. 1) Our numbers leave out Harding Golf Course, but they include it. 2) Our numbers are for the most recent year, 2013. Though the phrasing of the sentence suggests that are considering current usage, they may actually have used historic numbers. It’s possible that other sections of SFRPD reduced their herbicide usage, even while NAP’s herbicide usage went up. NAP herbicide use rose annually from 2009 through 2013. 3) We have only considered the chemicals that are most concerning – the “more hazardous” and “most hazardous” herbicides (those the San Francisco Department of the Environment classifies as Tier II and Tier I) and omitted the “least hazardous” ones (Tier III). 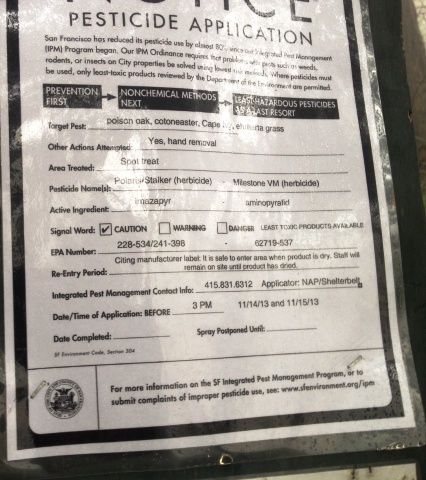 Possibly SFRPD has included Tier III herbicides. We think this would distort the comparison; it would be like comparing pineapples and hand-grenades. 4) If it’s based on the SF DoE’s new database, it may have data-entry errors, especially for data since 2010 when the new database was instituted. We compiled the Monthly Pesticide Usage reports ourselves, and re-checked them. 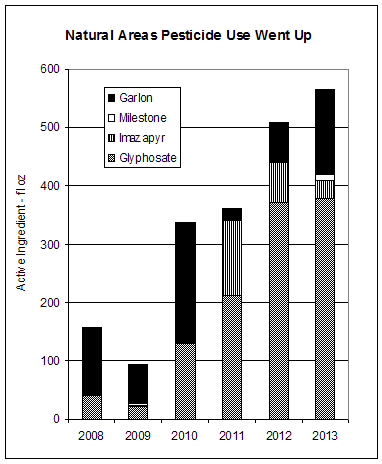 We obtained Monthly Pesticide Usage reports from SFRPD under the Sunshine Act. If any of them were unclear, we got clarifications. We compiled this data into a spreadsheet. Then we calculated Tier I and Tier II herbicide usage separately for NAP and for all other SFRPD (excluding Harding Golf Course), using SF DoE’s ratings. 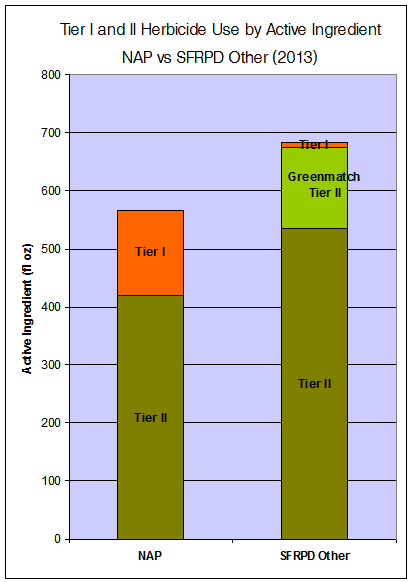 We show “Greenmatch” separately – it’s rated Tier II, but it’s an organic herbicide that is less harmful than most Tier II products. Until 2013, it was rated Tier III, least hazardous. In the first two months of 2014, NAP was still the major user of Tier I herbicides, using 8 times as much as all the rest of SFRPD ex Harding. STOP polluting the land and water with pesticides and herbicides. Birth defects and illness are increasing due to the toxic load. This is a backward policy. Figure out some greener solutions than dumping toxics.